Hermsiton's Luis Ortiz grabs a rebound following a Lava Bear shot on Saturday. HERMISTON - The Hermiston Bulldogs defeated the Lava Bears 69 to 43 on Saturday, February 7, 2009. 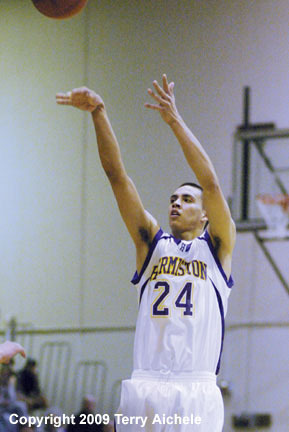 Hermiston dominated the game on the strength of accurate shooting and a dominent defense. Hermiston held the Lava Bears scoreless for the first four minutes of the first period. During that time Hermiston had scores by Bradley Irwin, Bicardo Rodriguez, and Luis Ortiz to take a 21 to 11 lead at the end of the first. Ortiz had a scorching period hitting three treys including a buzzer beater at the end of the period. The two teams had just about even scoring in the second period. 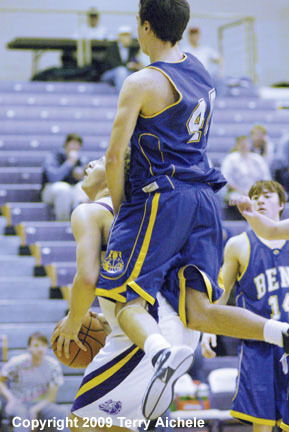 The Dawgs edged the Lava Bears for points in the period 17 to 16 while holding a 38 to 27 lead at halftime. Bulldogs scoring in the second included Jonathan Kayembe, Cody Meeks, Mike Royer, Rylie Smith, and Irwin. The Lava Bears could only muster three points in the third period while Hermiston scored 15 to take a dominating 53 to 30 lead. 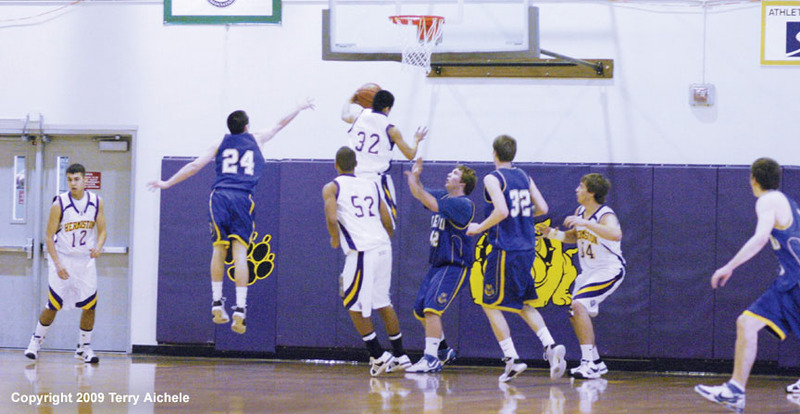 Players scoring for the Bulldogs included Dorian Williams, Rodriguez, Ortiz, and Royer. Hermiston continued to control the game in the fourth period. Dawgs scoring in the fourth included Austin Boedigheimer, Royer, Smith, and Kayembe. 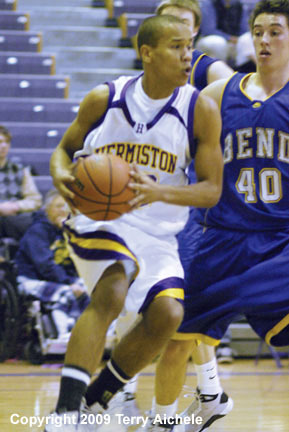 Hermiston won 69 to 43. The Bulldogs have improved throughout the season. The Dawgs team play has become more coesive and they pretty much know the moves and timing of their teammates. The timing of bounce passes, breakaways and set ups has given the Dawgs a fluid and stronger game. Cody Humphrey has helped a lot in the middle both on offence and defense. 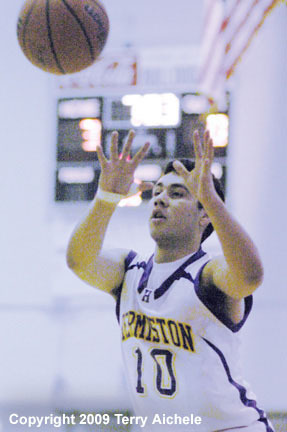 LEFT - Ricardo Rodriguez of Hermiston passes the ball early in the game on Saturday. 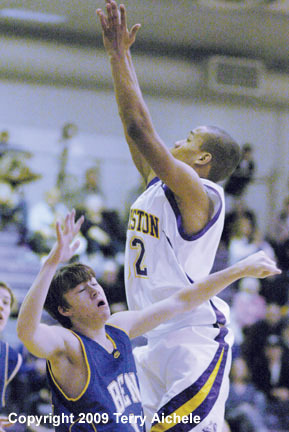 RIGHT - Hermiston's Jonathan Kayembe takes a shot over a Bend defender. LEFT - Jonathan Kayembe of Hermiston rolls around a Bend defender. 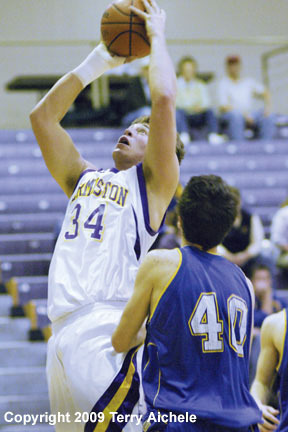 RIGHT - Cody Meeks of Hermiston lets fly with a jump shot on Saturday.